Location, Location, Location! 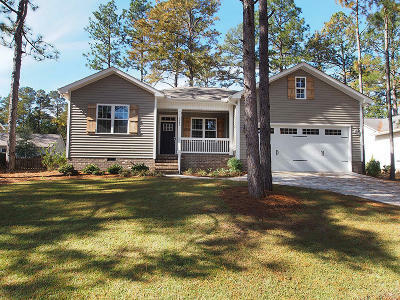 2645 SW Longleaf Dr. is conveniently located in the heart of Pinehurst. This home is like new, built in 2017 and offers single level living. An open kitchen and spacious Living room, great for entertaining and a split bedroom floor-plan. Some of the features include concrete driveway, beautiful hardwoods, master bath offers double vanities and claw-foot tub. Do not miss the opportunity to view this great home! © 2019 Multiple Listing Service of the Mid Carolina Regional Association of REALTORS® All rights reserved. The data relating to real estate for sale on this web site comes in part from the Internet Data Exchange Program of the Mid Carolina Regional Association of REALTORS® MLS. Real estate listings held by brokerage firms other than Remax Prime Properties are marked with the Internet Data Exchange logo or the Internet Data Exchange thumbnail logo and detailed information about them includes the name of the listing brokers. The broker providing these data believes them to be correct, but advises interested parties to confirm them before relying on them in a purchase decision. Information last updated on 2019-04-20.